I see this question get asked a lot on forums, most people never touch the firewall, ‘if it’s working leave it alone’. And that’s great until you move offices, or get a newer faster (or cheaper) Internet connection. What if you have lots of public IP addresses? What if you have VPN’s (or AnyConnect clients). What’s the best way to do this with a minimum of downtime? Note: If you get your all your outside IP details via DHCP, and no one speaks you you from outside (i.e. The ISP always reserves and issues the same IP details to you because you have a mail server or have VPN connections etc). Then you can probably simply plug into the new Router/Modem/Socket and reboot the ASA. OK lets not run to the comms rack with a laptop and get stuck into the problem, get all your ducks in a row first. ISP Tech Support phone number. 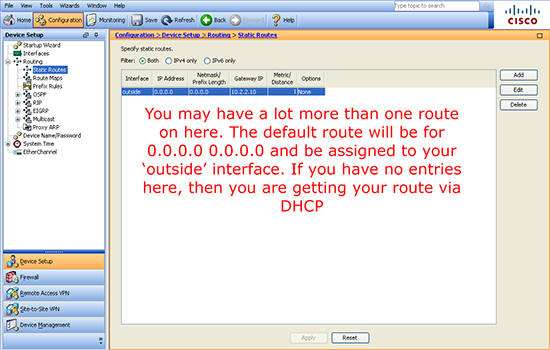 IP Address(s) allocated to you from the ISP. (Including the subnet mask and IP of their router if applicable). Username and Passwords for your Internet Connection (if applicable i.e. for ADSL, PPPoE etc). The details, of any public DNS records that point to you i.e. The MX records for your email, or URLs for any web services you host etc. If you have a web portal for managing this make sure you can log in. Or if your ISP handles this, get the information on how you can change your host records to point to the new IP address, (i.e. a fax on company headed notepaper, or a call to your account manager etc). 2. Your New Internet Connection: See everything you did above? get all the same information for the new ISP. 3. Backup: You are only ever as good as your last backup, make sure the ASA is backed up before you start, and backup to TFTP, or via the ASDM NOT by copy pasting the config into Notepad (this tends to hide shared secrets etc). 4. 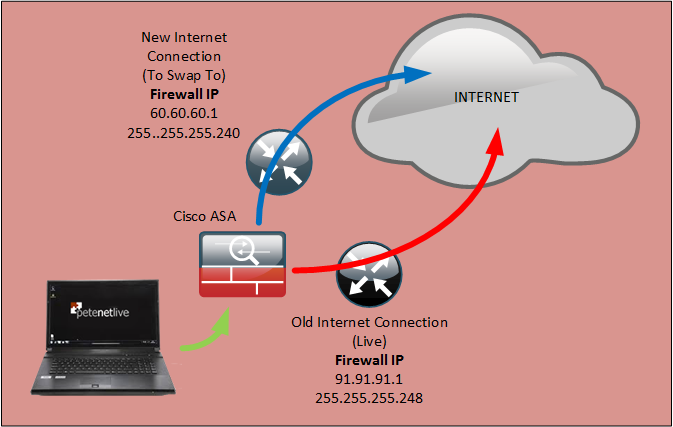 Test The New Internet Connection: I’ve had many a call from a colleague, that they can’t get an ASA working through a new Internet connection. And when I tell then to turn off the ASA and plug their Laptop into the Router/Modem/Socket guess what? Yes, the connection that the salesmen at the ISP said was live, really isn’t! Warning: Sometimes you find that if you have used the public IP your ISP gave you on your laptop, that when you plug in the ASA it won’t work, (this happens because the router ‘caches’ the MAC address of the Laptop, and get confused when the ASA uses the same IP). 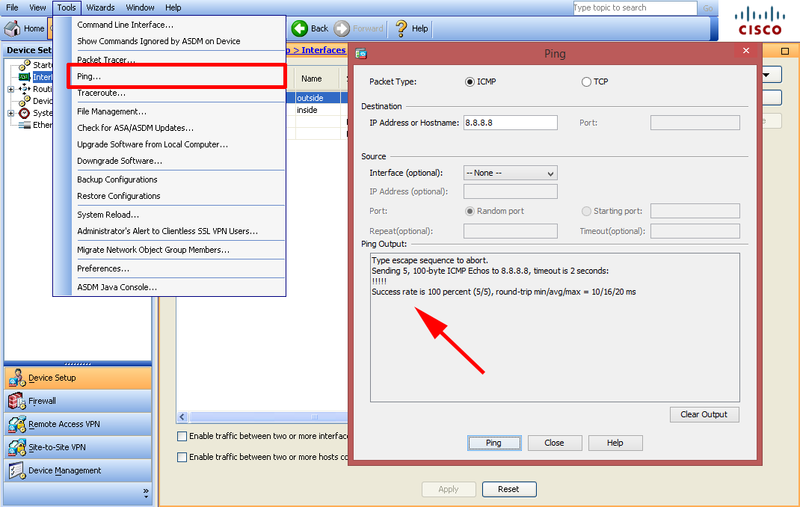 So if possible use a different IP for testing, (if you have more than one IP). Or turn the ISP equipment off for a while after testing. 5. Who talks to you? What speaks to the ASA from outside? Do you have a web server, email server, FTP server, public facing service. Do have other offices that connect to you via VPN? Do you have remote workers that connect via VPN/AnyConnect? 5a. What Other Public IP’s Do You Use? You may have covered this in point 5 but now I’m talking about the public IP addresses that are in use but NOT assigned to the outside interface. Typically these are used in what we call static NAT. If you have other sites with VPNs to you, they will need changing to point to the new public IP address. Now you’ve read all the above, you have a better appreciation of what you might break, and how much downtime to expect. 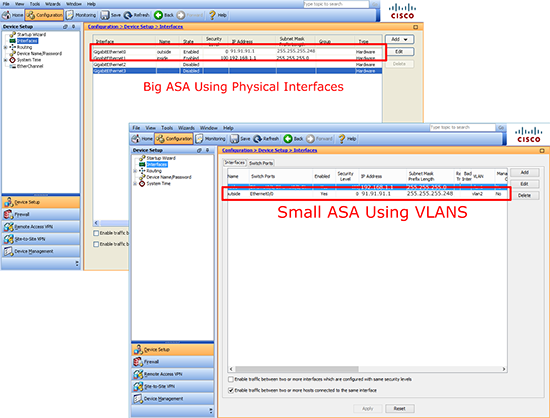 The outside interface of the ASA is exactly the same as any network connection it needs an IP address, a subnet mask, and a default route (same as default gateway for you Windows types). then you are getting these settings dynamically from your ISP. Configuration > Device Setup > Interfaces. Now we know out interface name and where the IP address and the subnet mask are. Now we need to locate the default route for the ‘outside’ interface, (or whatever yours is called). Configuration > Device Setup > Routing > Static Routes. Now you know the interface name, you know know its physical name, (GigabitEthernet0, Vlan 2, etc.) 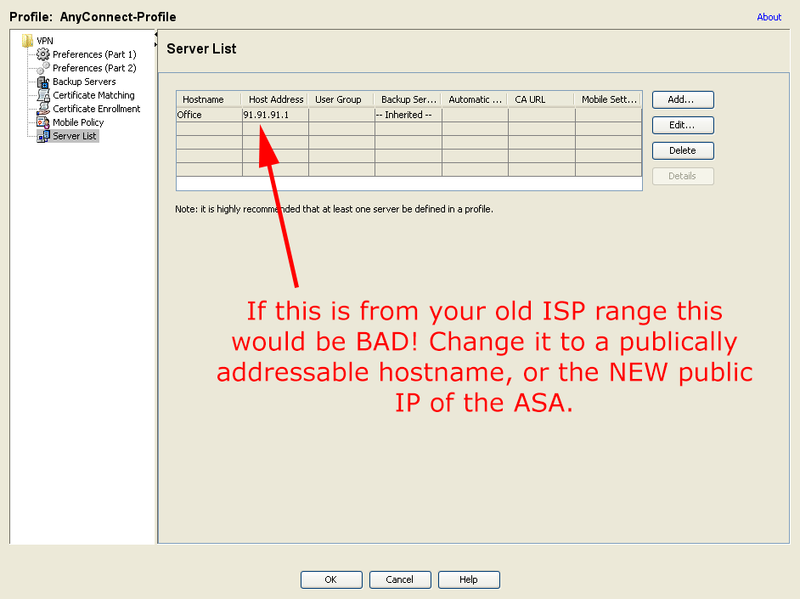 You have all the information you need to change the IP address, subnet mask and default route. In the ASDM you go to the same sections you did above, select the interface or route, click edit, then make the change. 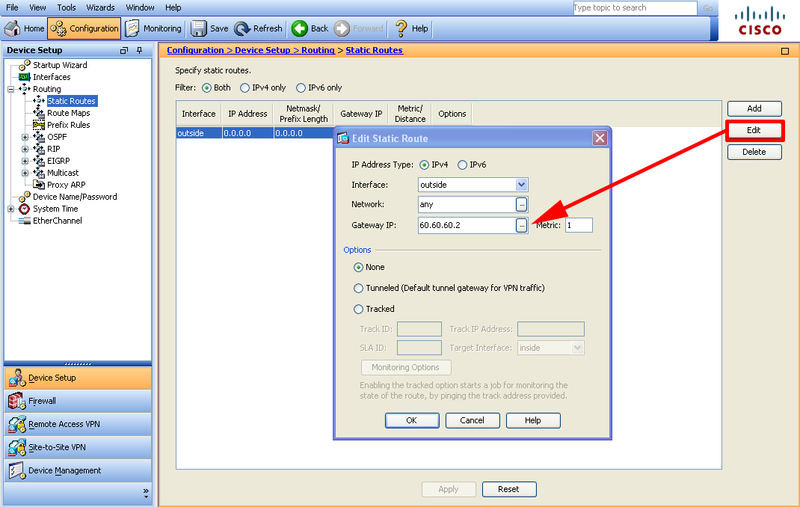 Note if you are going to use PPPoE read the following article. Don’t forget to click Apply! 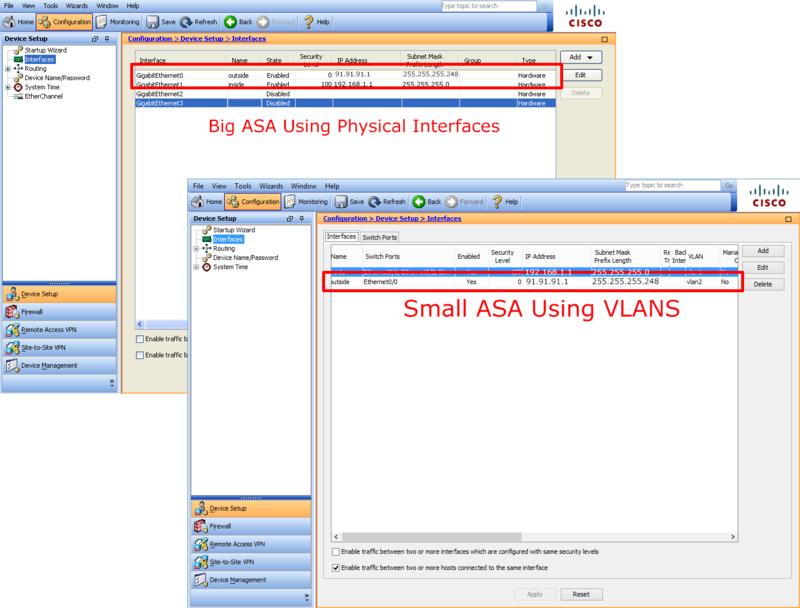 Before we look at anything else we need to make sure the ASA has connectivity to the Internet, and THE ASA can ping a public ip address (Note: I said the ASA, not something on your network). I usually ping 8.8.8.8 (Google DNS server) because it always responds. If this fails, ensure you can ping your ISP router (default route IP) this should be pretty easy to troubleshoot with the assistance of the ISP. 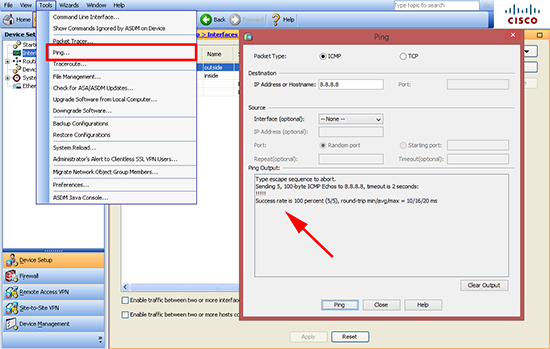 If you are performing ‘port forwarding‘ from the outside interface, i.e. 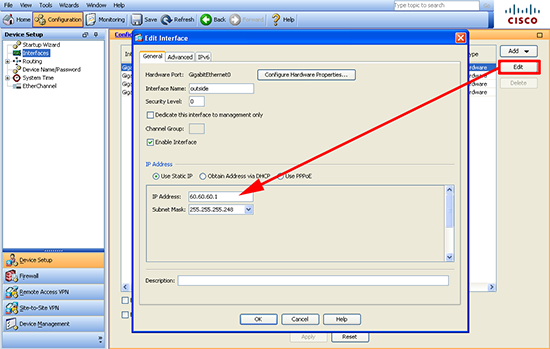 taking all SMTP (TCP Port 25) traffic and forwarding it to an internal host, then the firewall should require no further configuration as that should be done from the interface name NOT the old public IP address. 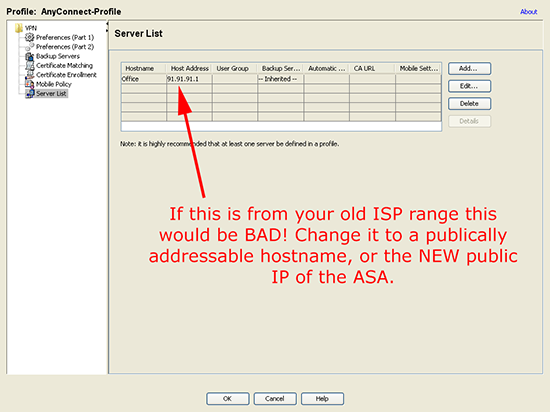 To do the same in the ASDM, is a little more convoluted you need to check every NAT rule and see if you have one thats type is ‘static’ and has an IP address from your old ISP range, then you can change it accordingly. 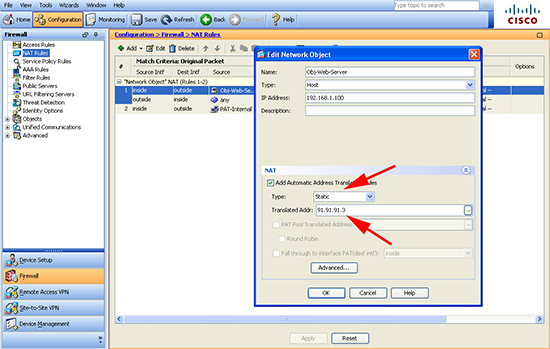 As above if your AnyConnect clients connect directly to a public name like vpn.yourbusiness.com then just change that record to point to the new public IP address. 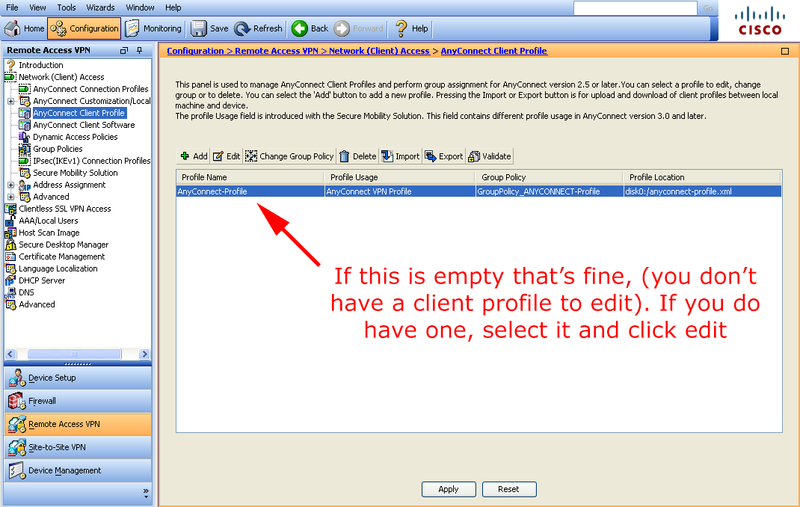 Just be aware if you have set the AnyConnect profile to point to your old IP address, then your remote clients will automatically break themselves every-time they connect and download the profile, change it to the new IP address, or even better a public name/URL. 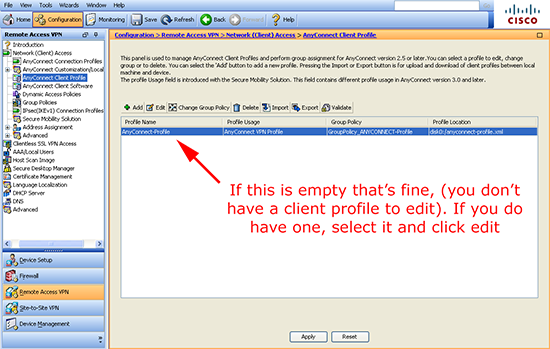 Configuration > Remote Access VPN > Network (Client) Access > AnyConnect Client Profile. 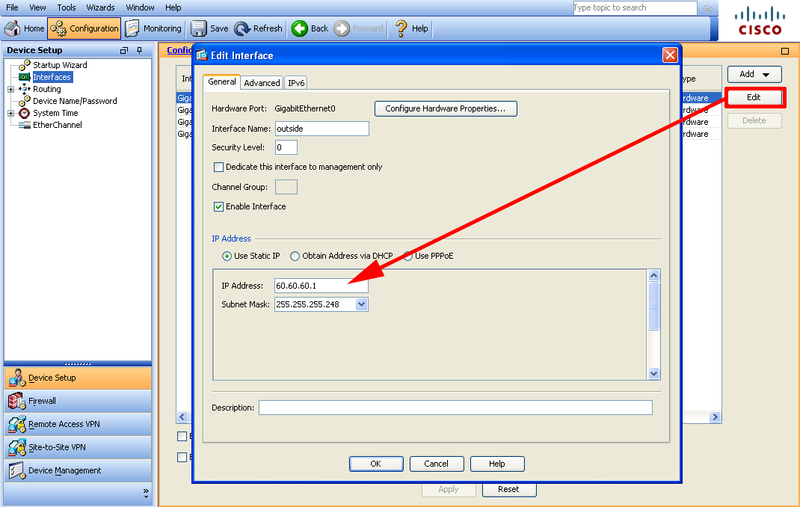 Dont Forget: Save any changes you have made to the firewall either with a ‘write mem‘ command, or File > Save running configuration to flash, if you’re in the ASDM. I think I’ve got most stuff covered, if I’ve missed something that’s caused you problems let me know, and I will update this article accordingly (contact link below).